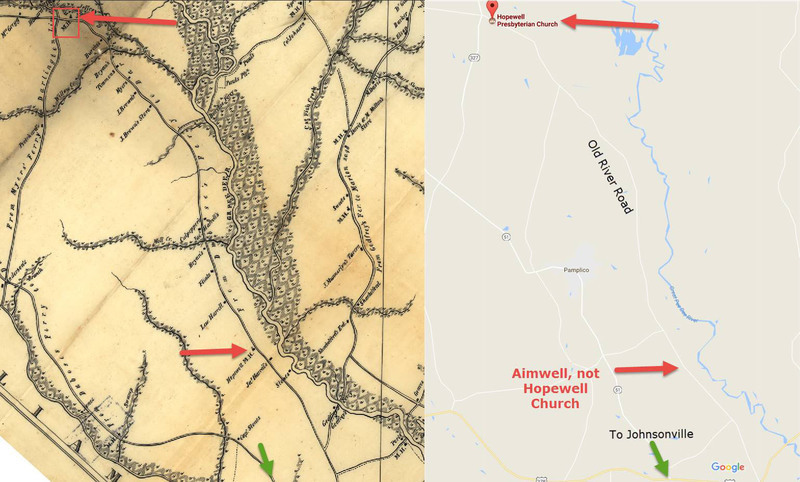 Aimwell Church location on the Robert Mills map of Marion County (1825) and current mapping. The church is incorrectly shown as Hopewell, which is further up Old River Road. Aimwell Presbyterian Church was a Presbyterian congregation located along what is now Old River Road, approximately at the intersection of Old River Road and McWhite Circle. The approximate GPS coordinates are 33°56'28.2"N 79°29'50.4"W. The Robert Mills Map of Marion County (1825) incorrectly lists the Aimwell Meeting House as Hopewell Meeting House. Hopewell on the Mills map is simply listed as "Meeting House" which was not an uncommon mistake with early maps of unfamiliar locations. "Your petitioners have associated and at a considerable labour and expence built a House for Divine Worship, they pray that they may be incorporated by the name and denomination of the Presbyterian Church of Aimwell on Pee Dee and that they may be entitled to such privileges and invested with such powers as hath been heretofore granted to other societies in similar cases, and your petitioners as in duty bound shall ever pray." 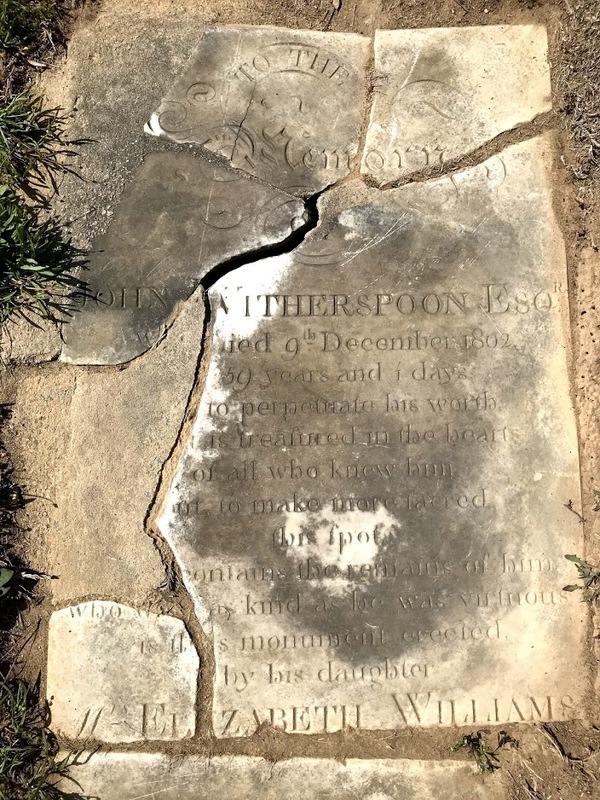 The Aimwell burial ground still exists and is the resting place of John Witherspoon, whose family operated Witherspoon's Ferry during the American Revolution. John Witherspoon was a patriot of the American Revolution, serving as a private with Marion's Brigade in the Britton's Neck Regiment for 244 days in 1780 and 1781. He inherited Witherspoon's Ferry from his brother, Robert Witherspoon. 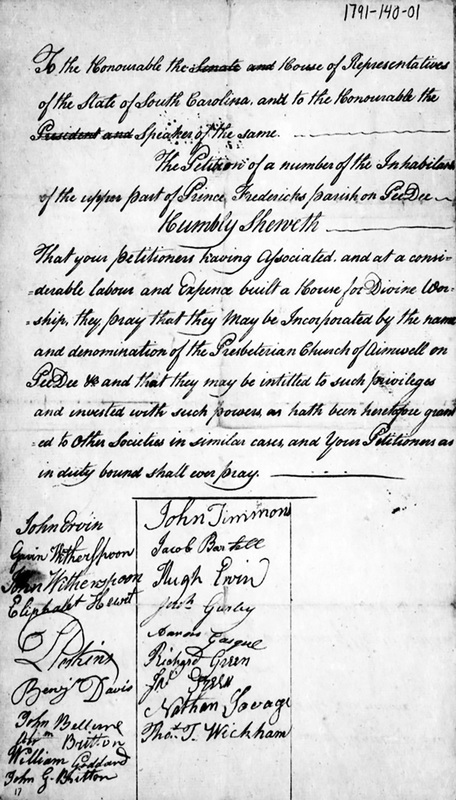 John's will in 1802 states that the Ferry should continue to operate in benefit of Aimwell Church under the care of his executor, John D. Witherspoon. His daughter Elizabeth Witherspoon is also mentioned. William Johnson (later founder of the Johnsonville post office and town namesake) is listed as well as having leasing rights to the Ferry land as long as the trustees mentioned in the will agree to his wisdom and he conducts himself with propriety. Not much is known about the history of Aimwell or when exactly it ceased services, other than that it was closely tied with Hopewell Presbyterian Church which was located further up River Road away from Johnsonville. "Aimwell became extinct in 1820. Some of the heads of families had died and others moved up more convenient to Hopewell and became members of that church." "The Aimwell Church, Pedee, was situated about a mile from the Pedee River and about ten miles above the junction of Lynches Creek. It was probably organized early in this period (from 1770-1780). It was founded by families from either Williamsburg or Indiantown, or both. The families, we have said, were those of Hugh Ervin, John Ervin, Gavin Witherspoon, and John Witherspoon, and a few others. These families were living on the Pedee in the Revolutionary War and took an active part in it. John Baxter preached previously in this neighborhood at the house of Mrs. Britton, and on Britton's Neck before 1765, as his register shows. Hopewell Church, Pedee, is about four miles from the Pedee, twenty miles above Aimwell, and on the road from Cheraw to Georgetown. It was organized about the year 1770. Of Aimwell Church on the Pedee, as to its spiritual condition no record has been transmitted. Its fortunes were united in after-times with those of Hopewell, twenty miles above. Robert McColloch was appointed to supply it in 1789. But we find in civil history many and thrilling accounts of the sufferings and valor of all this region, peopled by the descendants of the first settlers of Williamsburg. It was they, already risen in arms, that summonded the undaunted Marion from the camp of Gates to be their leader. Gavin and John Witherspoon of this congregation were with him."